The Soviet Union national football team (Russian: сбо́рная Сове́тского Сою́за по футбо́лу, sbornaya Sovyetskogo Soyuza po futbolu) was the national football team of the Soviet Union. After the breakup of the Union the team was transformed into the CIS national football team (a formality name for a team of the non-existing country of Soviet Union). FIFA considers the CIS national football team (and ultimately, the Russia national football team) as the Soviet successor team allocating its former records to them; nevertheless, a large percentage of the team's former players came from outside the Russian SFSR, mainly from the Ukrainian SSR, and following the breakup of the Soviet Union, some such as Andrei Kanchelskis from the former Ukrainian SSR continued to play in the new Russia national football team. The Soviet Union failed to qualify for the World Cup only twice, in 1974 and 1978, and attended seven finals tournaments in total. Their best finish was fourth in 1966, when they lost to West Germany in the semifinals, 2–1. The Soviet Union qualified for five European Championships, winning the inaugural competition in 1960 when they beat Yugoslavia in the final, 2–1. They finished second three times (1964, 1972, 1988), and fourth once (1968), when, having drawn with Italy in the semi-final, they were sent to the third place playoff match by the loss of a coin toss. The Soviet Union national team also participated in number of Olympic tournaments earning the gold medal in the 1956 and 1988. The Soviet team continued to field its national team players in Olympic tournaments despite the prohibition of FIFA in 1958 to field any national team players in Olympics. However, in 1960 and in 1964 the Soviets were fielding its second national team. The first international match played by a Soviet team came in August 1923, nine months after the establishment of the Soviet Union, when a Russian SFSR team beat Sweden 2–1 in Stockholm. The first formally recognised match played by the Soviet Union took place a year later, a 3–0 win over Turkey. This and a return match in Ankara were the only officially recognised international matches played by the Soviet Union prior to the 1952 Summer Olympics, though several unofficial friendlies against Turkey took place in the 1930s. The 1952 Olympics was the first competitive tournament entered by the Soviet Union. In the preliminary round, Bulgaria were defeated 2–1, earning a first round tie against Yugoslavia. Yugoslavia led 5–1, but a Soviet comeback in the last 15 minutes resulted in a 5–5 draw. The match was replayed, Yugoslavia winning 3–1. The Soviet Union entered the World Cup for the first time at the 1958 tournament, following a qualification playoff against Poland. Drawn in a group with Brazil, England and Austria, they collected three points in total, one from England and two from Austria. Soviet Union and England went to a playoff game, in which Anatoli Ilyin scored in the 67th minute to knock England out. The Soviet Union were then eliminated by the hosts of the tournament, Sweden, in the quarter-finals. The inaugural European Championships in 1960 marked the pinnacle of Soviet footballing achievement. Easily progressing to the quarter-finals, the team were scheduled to face Spain, but due to the tensions of the Cold War, Spain refused to travel to the Soviet Union, resulting in a walkover. In the semi-final, the Soviet team defeated Czechoslovakia 3–0 and reached the final, where they faced Yugoslavia. In the 1962 World Cup, the Soviet team was in Group 1 with Yugoslavia, Colombia and Uruguay. The match between Soviet Union and Colombia ended 4–4; Colombia scored a series of goals (68’, 72’, 86’). Star goalkeeper Lev Yashin was in poor form both against Colombia and Chile. His form was considered as one of the main reasons why Soviet Union team did not gain more success in the tournament. In 1964, the Soviet Union attempted to defend their European Championship title, defeating Italy in the last 16 (2–0, 1–1) and to reach the quarter-finals. After two matches against Sweden, the Soviet side won on aggregate (1–1, 3–1). The Soviet Union team went to Spain where the finals were held. In the semi-finals, the Soviet Union defeated Denmark 3–0 in Barcelona but their dreams of winning the title again were dashed in the final when Spain, the host, scored a late goal, winning a 2-1. The 1966 FIFAWorld Cup was the tournament which the Soviet Union team reached their best result by finishing in fourth place. Soviet Union was in Group 4 with North Korea, Italy and Chile. In all three matches, the Soviet Union team managed to defeat their rivals. The Soviet team then defeated Hungary in the quarter-finals thanks to the effective performance of their star, Lev Yashin but their success was ended by two defeats on 25 and 28 July, against West Germany in the semi-finals and Portugal in the third place play off match, respectively. The 1966 squad was the second best scoring Soviet team in the World Cup history, with 10 goals. For the Euro 1968, the qualification competition was played in two stages; a group stage (taking place from 1966 until 1968) and the quarter-finals (played in 1968). Again, only four teams could reach the finals which were held in Italy. The semi-final match between Soviet Union and Italy ended 0–0. It was decided to toss a coin to see who reached the final, rather than play a replay. Italy won, and went on to become European champions. On 8 June 1968, the Soviets were defeated by England in the third place match. The 1970 World Cup started with the match between Mexico and the Soviet Union. The Soviet team became the first team to make a substitution in World Cup history in this match. Other opponents in their group were Belgium and El Salvador. The Soviet team easily qualified to the quarter-final where they lost against Uruguay in extra time. This was the last time the Soviet Union reached the quarter-finals. They were able to obtain 5th place in the rankings which FIFA released in 1986. The final tournament of the 1972 European Championships took place between 14 and 18 June 1972. Again, only four teams were in the finals. Soviets defeated Hungary 1–0, a second half goal. The final was between West Germany and Soviet Union. The match ended with a victory of the German side thanks to the effective football of Gerd Müller. This tournament was one of the two tournaments in which the Soviet Union finished as runner-up. The Soviet Union u-20 team playing the Argentine side at the 1979 FIFA World Youth Championship. The rest of the 1970s were bleak for the Soviets, who were disqualified from the 1974 World Cup as a result of refusal to play Chile in the aftermath of the 1973 Chilean coup d'état, and failed to qualify for the 1978 World Cup or the 1976 and 1980 European Championships. The 1982 World Cup was the Soviet Union's first major tournament appearance for a decade. The Soviet Union was in Group 6 with Brazil, Scotland and New Zealand. Goals by Socrates and Eder marked the defeat of the Soviet side against Brazil in the first group match(even though it was a very hard match for the Brazilians), and they were eventually eliminated in the second round by finishing the group in second place, when they defeated Belgium only 1–0 and drew against Poland with an 0–0 result. In 1984, the Soviets again failed to qualify for the European Championships, but succeeded in qualifying for the 1986 World Cup. Soviet Union were in Group C with Hungary, France and Canada. The Soviets used Irapuato, Guanajuato as their training ground in the World Cup. Soviet team enjoyed a successful group stage by scoring nine goals and finishing the group in the first place. It seemed like the Soviet side managed to forget their unsuccessful performance in 1982, but they lost to surprise package Belgium 3–4 in the round of 16 after extra time. Despite their poor performance in the cup, Soviet Union team was the best scoring Soviet team in the World Cup history, with 12 goals. After failing to qualify for three consecutive times (1976, 1980, 1984), the Soviets managed to qualify for the 1988 competition, the last time the Soviet Union national football team took part in the European Football Championship. The finals were held in West Germany. Eight teams were participating this time. Soviet Union finished Group B as leaders above the Netherlands and reached the semi-finals. There, the Soviets defeated Italy 2–0. In the final between Soviet Union and the Netherlands, rival of Soviet Union from Group B, the Netherlands won the match with a clear score and became the European champions. The final major championship contested by the Soviet team was the 1990 FIFA World Cup, where they were drawn in Group B with Argentina, Romania and Cameroon. The only success of Soviet Union in the whole tournament came when they managed to beat the group leaders, Cameroon by 4–0. The Soviet team lost their other matches and failed to qualify from the group. The Soviet Union qualified for Euro 1992, but the breakup of the Soviet Union meant that the finals place was instead taken by the CIS national football team. After the tournament, the former Soviet Republics competed as separate independent nations, with FIFA allocating the Soviet team's record to Russia. The following statistic is based on the statistic published in Sovetskiy Sport of December 1991. The game that took place on 21 November 1973 between the national team of Chile and missing side did not go on record of Yevgeny Goryansky. 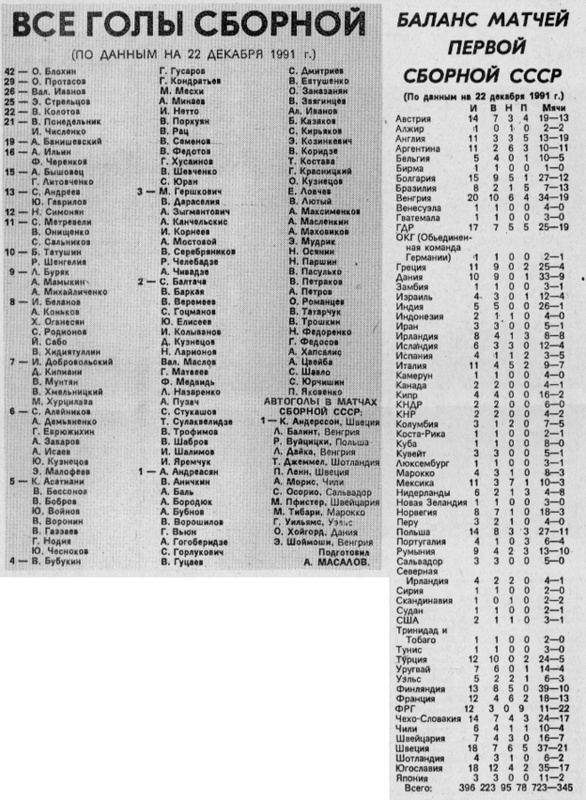 The 1980 USSR Olympic roster (coach - Beskov) was identical with the senior team that competed in qualification tournaments in 1979-1981. In 1985-1989 the national team competed in the annual Nehru Cup (India). The 1st coaching staff consisted of Valeriy Lobanovsky (leading), Yuri Morozov and Sergei Mosyagin. The 2nd coaching staff consisted of Anatoly Byshovets (leading), Vladimir Salkov and Gadzhi Gadzhiyev. Since Soviet's first fixture (16 November 1924 vs. Turkey) they have played their home games at various stadiums. Statistics include official FIFA-recognised matches only. Although never used by either the Soviet Union national football team nor Soviet Union Olympic football team, Dynama Stadium in Minsk was designated as the official stadium for the 1980 Summer Olympics. Wikimedia Commons has media related to Soviet Union national association football team. This page was last modified on 18 November 2015, at 04:09.